Type 2 Diabetes and Heart Disease: Are You at Risk? Believe the food hype. It really does make a difference if you eat heart-healthy meals. Simple tweaks to your diet can have big benefits whether you want to prevent future problems, already live with high cholesterol or blood pressure, or have heart trouble like atrial fibrillation. Focus on lean meats, vegetables, and whole grains to get long-term benefits for your ticker and your waistline. A crash diet may work if you're trying to fit into a new outfit by next month. But if you want to improve your heart health, cycling through different fad diets won't help. Meal plans that rule out one type of food, whether it's carbs or fat, don't work either. Instead, take a sensible approach. A study of more than 42,000 healthy women shows that those who ate meals that emphasized veggies, lean meats, grains, and low-fat dairy were 31% less likely to die in the next 6 years than women with unhealthy diets. Overeating will make you gain weight, but that's not all. Studies show that more people have heart attacks after big meals. Watch out for restaurant portion sizes. The CDC says the amount of food in an average restaurant meal today is like four restaurant meals from the 1950s. Studies show that the bigger the portion you're served, the more you'll eat. The solution? Get in the habit of eating only half of what's on your plate. You can take the rest home. What's so special about whole grains? They help control your blood sugar, which lowers your chances of getting diabetes. That's important because diabetes raises your risk for heart disease. People who eat a lot of whole grains tend to weigh less, too. Go for whole wheat breads, brown rice, wild rice, oatmeal, cornmeal, barley, and rye. Another benefit is that whole grains help lower LDL cholesterol. That's the bad kind that contributes to heart attacks and strokes. Fill up on fiber. It absorbs fat while you digest your food and cuts down swelling in your arteries. It also helps you control your weight because it makes you feel full faster. Besides whole grains, other good sources include fruit, veggies, nuts, and beans. Red meat is usually high in saturated fat, which may be bad for your heart. That doesn't mean you have to banish it from your diet. Just be savvy. Look for lean cuts like sirloin, flank, rump roast, and tenderloin, and always trim the fat. Or choose pork tenderloin, turkey, or chicken breast instead. Add more fish to your diet. You probably know it's good for you, but not all fish is equal. Deep-fried cod doesn't count. 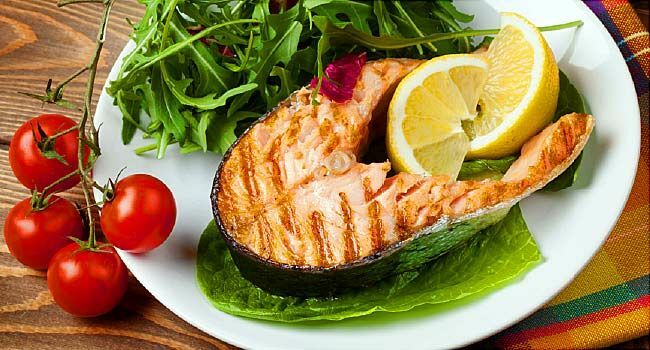 Grill or roast fish that's high in healthy omega-3 fatty acids, such as salmon, tuna, trout, and sardines. Think that a smoked turkey sandwich is a healthier choice than a burger? Don't be so sure. Deli meats are often packed with salts, nitrates, and preservatives that can be bad for your heart. Whole chicken breasts and in-house roasted turkey are better. You probably need to cut back. Most people do. Aim for no more than a teaspoon a day. If you already have high blood pressure, you should eat even less. Most Americans think sea salt is a low-sodium alternative to regular table salt. Wrong. It has the same amount of sodium. Any type of salt raises your blood pressure. Salt doesn't just come from the shaker. Up to 75% of the salt you eat is from processed foods like soups and frozen meals. Always check the label to find out how much sodium is in it. If you have atrial fibrillation, caffeine and other stimulants can trigger symptoms. Drink them in moderation. Studies show that drinking modest amounts of alcohol, not just wine, has heart benefits. But don't assume that if a glass is good, a jug must be better. More than one drink a day for women or two for men raises your odds for heart problems. It drives up blood pressure and can trigger irregular heartbeats in people with atrial fibrillation. If you eat these foods, keep the amount that you have about the same from day to day. Before you add any vitamin K foods to your diet, talk to your doctor. You may be able to introduce small amounts slowly. American Heart Association: "Most Americans Don't Understand the Health Effects of Wine and Sea Salt, Survey Finds." CDC: "Lifetime risk for diabetes mellitus in the United States." N.A. Mark Estes III, MD, director, New England Cardiac Arrhythmia Center, Tufts University School of Medicine, Boston. Heart Healthy Women: "Diet," "Heart Healthy Diet -- Fiber and Grains." Making Health Easier: "The New (Ab)Normal." Gordon Tomaselli, MD, cardiology division chief, Johns Hopkins University School of Medicine, Baltimore.